Welcome to Lac Seul’s Golden Eagle Resort. We are a drive-to camp located in Northwest Ontario on beautiful Lac Seul. We offer fully modernized housekeeping cabins that are located on the waterfront. All you need to bring is your own towels and food, although there are two grocery stores within two kilometres and a liquor store as well. Our fishing packages are geared to your individual needs. We can accommodate groups up to 28, families or couples. We have a Family Fishing Package for July and August. We offer boat launching and docking facilities. There is a fish cleaning house at dockside with running water. We have live bait, fishing tackle and bagged ice for sale on site. Fish wrapping and freezer service are included. All cabins have wifi and cell coverage. Follow us on Facebook! RVs and campers are welcome. Cabin Rentals (Housekeeping): A fishing trip to Canada at Lac Seul's Golden Eagle on Lac Seul in Ear Falls, Ontario offers 5 modern cabin rentals. Private Campground: Our campground and RV Park will provide you with access to some of the best walleye fishing in Canada on Ontario's famous Lac Seul! Walleye: Lac Seul is one of Ontario's most productive walleye lakes, it can consistently produce limits of walleye whatever the season or day. Muskie: A Canadian muskie fishing trip to Lac Seul is a must. You'll have the fight of your life when you hook into one of these giants. 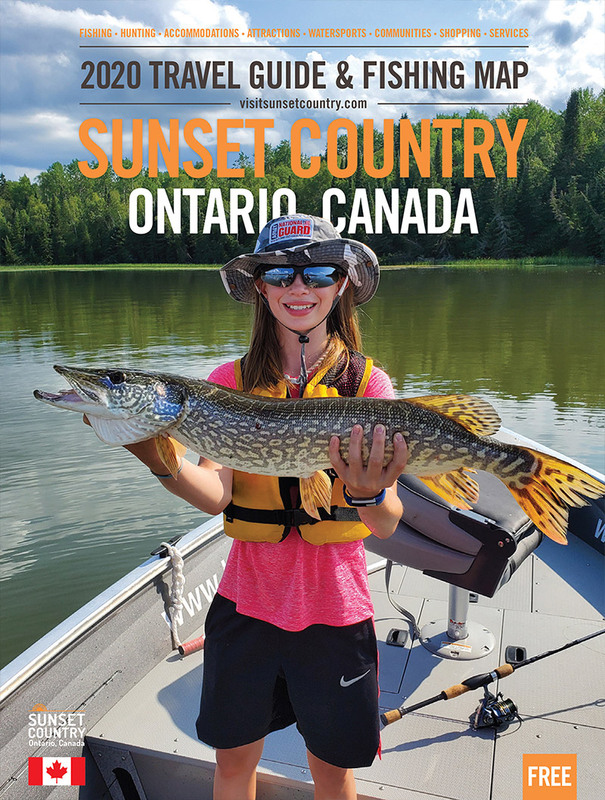 Smallmouth Bass: Smallmouth bass fishing on Lac Seul is becoming a great location for anglers to have a great Canadian fishing experience. Moose: If you are looking for accommodations for Ontario moose hunting, we are located in the Ear Falls area of Northwestern Ontario on Lac Seul. Grouse: Plan your fall bird hunting trip with Lac Seul Golden Eagle Resort in the Ear Falls, we have three species of grouse: Ruffed, Spruce and Sharptail. Duck: Plan a hunting trip in the Ear Falls, Ontario area of Sunset Country. There is excellent duck hunting in the areas around Lac Seul.